Do you and your family love watching Survival and Bushcraft programmes on TV? Do you as a family fancy trying some of the skills for yourselves?? Do you dream about sleeping out in your own shelter or cooking on the fire that you lit? Maybe one of your children longs to know how to practice bushcraft. 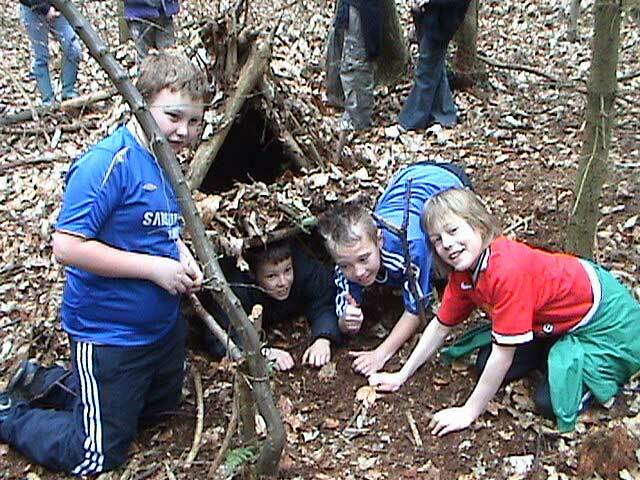 Our Wilderness Family Camp may be just what your looking for! 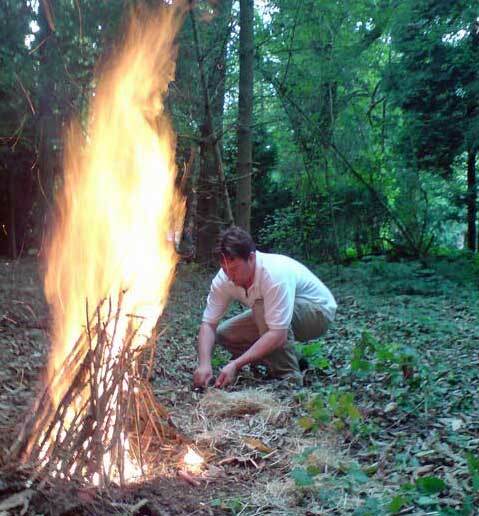 What you need to build and light an ideal fire....we'll show you where to gather your materials and how to master the essential skill of lighting a fire easily. How to construct a Natural Debris Shelter that’ll keep you warm and dry. We will show you how to build three different shelters and you can choose which one your family would like to build. How to light a fire without matches or a lighter.... Using a special pocket sized tool we will show your how to use it easily and quickly to light your fire. How to keep safe whilst using a Knife and other tools We stress how important it is to know the safe way to use tools. Cooking on the Camp Fire. You will be cooking on the camp-fire. This is a great opportunity for children to learn about and become comfortable with open fires. Together you will learn about fire health and safety and how to tend a fire and cooking skills. Learn exciting things about Plants and Trees. We'll walk through the woodland discovering the amazing things about our native plants and trees and how to use them. For instance: One common tree has leaves that contain a natural soap. Very handy for washing your hands after building your shelter! You’ll discover what this tree is -- how to identify it -- and how to wash your hands with it! Where to find the best and driest tinder. Its really important to know where to find tinder that you can use even when its raining. We'll show you how. How to make Cordage...We will show you how to use the plants from the woodland to make strong cords and string so you can tie things together. A very handy skill that you can use anywhere. Making Utensils. You will make valuable utensils from natural materials. Silent Movement & Peripheral Vision. You will discover how the Apache Indians moved so you too can get closer to wild life. Sleeping Out. Just imagine sleeping in your newly built shelter after an adventurous day of new experiences. Making fire by friction. You've seen how its done and how easy it looks on TV but now it will be your turn to put your hand to Fire by Friction. What a frill it will be when you get your first coal and blow a tinder bundle into flames. We’ll play fun Nature Awareness Games.. these games enhance the other skills that you'll have been practising and really switches you on to our natural world, giving you some exciting new experiences to share with your friends back home. How Animal moves. We will have fun finding our how animals move and this makes it easier when tracking them. Which Animal Track belongs to whom. You will discover the different tracks made by our native animals. You will find out about Concentric Rings and how wildlife communicates. Wow...what a fun time your family will have doing all these things together and just think how much your children will grow in confidence being out in nature and how much more they will know about our countryside. We do two types of Wilderness Family Camps a 'One Night Family Bushcraft Camp' and 'A Three Day Wilderness Family Camp'. So you have a choice of how long you would like your stay in the woods to be. We can't cover all the subjects on the shorter camp but you will still have a fun packed experience and you will go home with many new and exciting skills and experiences. Jack (8) and I had the most brilliant experience when we spent our four days out in the woods. Just getting the chance to be close to nature and away from all the things we think of as “essential” was so refreshing. It helped both of us to appreciate what is truly real, and also enjoy the energy of a group of people with similar aims. Amanda. Kent. You can bring tents with you so you can choose from a night in the shelter or a tent but we highly recommend trying out your shelter. As this camp is about getting back to basics and is held in woodland, we do not have the use of showers but will provide water, soap and bowl for washing. We also use a bush toilet which is within a toilet tent, don't be alarmed it is quite comfortable. We will send Kit list and directions to you via email or post if requested approximately one month prior to course date. Current Reviews: 7 Place A Tick Against An Item To Pay The Deposit.